Mike and Ian break down Wednesday’s loss to the Hornets in New Orleans. The New Jersey Nets come to the Big Easy after back-to-back wins and will try to make it three in a row for the first time in almost two years. The Hornets return home after a loss at Detroit on Sunday in OT and a heartbreaking defeat at the buzzer in Indiana. Both squads are 3-7 over their last ten contests, but the Newark boys seem to be on the upswing while the Hornets have lost some of their buzz after starting the season 11-1. The Nets ended a 10-game road losing streak to the Memphis Grizzlies last night by a score of 101-94. Center Brook Lopez led the team with a strong 26-point effort. Newcomer Sasha Vujacic came off the bench for 16 points, and seventh-year forward Kris Humphries pulled down 15 boards, including 4 on the offensive end. Coach Avery Johnson’s guys will have their work cut out for them trying to put points on the board against this stingy New Orleans team. The Hornets currently rank third in the NBA in points allowed at 92, while New Jersey is at the bottom of the league in scoring – 28th overall with 93 ppg. We’ll get to see two of the NBA’s top point guards Chris Paul and Devin Harris go at it tonight. Former First Team All-NBA player (2008) and 3x All-Star Chris Paul leads the NBA in steals and is fourth in dimes per game. 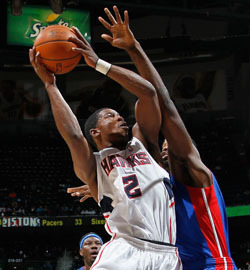 And All-Star Devin Harris has recently hit his stride, averaging 19.5 ppg and 7 apg over New Jersey’s last four games. Lopez will have his hands full with Hornets’ Emeka Okafor, a seventh-year center from UConn who had arguably his best game of this season in the loss to Indiana with a season high 15 rebounds. He also scored 19 points, had 3 blocks and 2 steals. 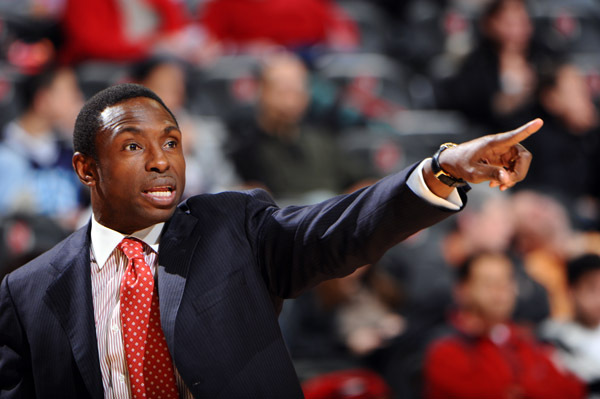 This should be a special night for New Orleans native Avery Johnson, who has remained connected to his hometown and will no doubt be greeted by many family and friends at the Arena. When New Orleans Saints head coach Sean Payton was hired back in ’06, he enlisted the local inspiration (who was coaching the Mavericks at that time) to serve as a motivational speaker for the team in its first training camp. Avery continued to be an ardent supporter and made subsequent pregame appearances including the Saints’ first home game in the Superdome after Hurricane Katrina and the 2010 Super Bowl. The Saints went on to become Super Bowl XLIV champs and Payton rewarded Johnson for his role in the team’s success with his very own Super Bowl ring. Avery Johnson is hoping for a similar rise-to-success story for his Nets. Last night’s victory in Memphis, the home of the Blues, coupled with a win tonight against the Hornets in Crescent City, the birthplace of Jazz, would be sweet, sweet music to Nets Nation. Ian Eagle and I have the call at 8:00 PM ET on YES. Certain teams started out the season like they were supposed to: The Lakers are undefeated, while the Heat and Celtics are 4-1. Meanwhile some other teams have surprised us. There were big question marks about the Hawks, Hornets and Blazers heading into the season and all three have gotten off to a much better start than expected. The Hawks steadily improved through each year of Coach Mike Woodson’s six-year tenure, culminating with three straight playoff appearances and an impressive 53-win season in 2009-10. In light of ownership’s decision to let Woodson go and the absence of any spectacular improvements to the roster, Atlanta’s future seemed tenuous. But since former assistant coach Larry Drew took over the reigns, his talented bunch (led by nine-year veteran Joe Johnson who’s averaging 19.6 PPG) have come out of the gates flying to five straight wins to lead the Eastern Conference. Afflicted by injuries, superstar point guard Chris Paul was only able to play in 45 games last year, and his Hornets had to settle for a disappointing 37-win season. With Chris Paul’s rehabilitation ongoing this summer, all the speculation surrounding rumors that he would demand a trade, and the firing of Coach Byron Scott, New Orleans was bracing for another touch-and-go season. But CP3 stayed, and in his first NBA campaign Head Coach Monty Williams has gotten off to an excellent start. Boasting a perfect 4-0 record, the Hornets trail the champion Lakers by just one win. And their future looks bright as Paul appears back to form, averaging over 35 PPG and 9 assists for fifth in the league. Touted as the next big thing just a few years back, the Trail Blazers were plagued with injuries last season. 13 players combined to miss 311 games including Joel Przybilla, Greg Oden and Brandon Roy. Considering Portland is still without big men Oden and Przybilla, they have gotten off to a surprisingly solid start. Last night the Blazers came up just one point short of a win over Durant and the Thunder in overtime to put their record at 4-2. The Blazers capitalized on a fortuitous opening season schedule, catching the Knicks, Suns and Clippers who are all struggling with subpar starts. 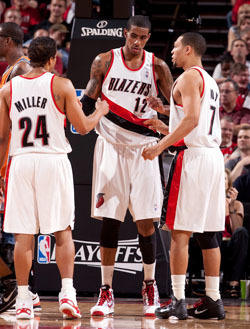 Portland is getting a balanced attack from Brandon Roy, LaMarcus Aldridge and Andre Miller who work well together. And guys like Nicolas Batum are stepping up while they await the return of their bigs. Nate McMillan is an excellent coach. Having assisted Coach K and Team USA, he didn’t have much down time in the off-season but came back ready to go. Przybilla is targeting November 26 for his return to the lineup so if the Blaze can stay healthy, they should continue to contend.